Panoramas are popular for showing all that you can see around you. But what if you want to show something that is straight? Consider a street. You are standing on one side and want to show everything on the other side up and down the street. Your camera lens is likely not wide enough to take in everything from full left to full right. A set of photos can be stitched together into a panorama. 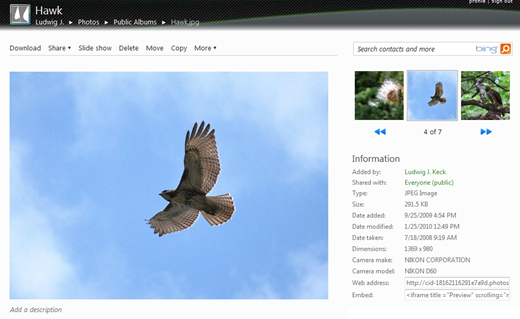 Windows Live Photo Gallery has a Create > Panorama feature that works quite well. I like to use Microsoft Composite Editor because it offers more adjustment features and is very easy to use. All it takes is a set of photos that show the scene step by step. The content of the photos has to overlap about a third to help the stitching program do its job. Here is a panorama of a street scene. The left end of the photo shows the street looking down to the left, and the right edge looks to the right. The street looks like it bends. The individual pictures were taken from one position – that is the normal way to make panoramas. Here, to explain what happens in more detail, is a set of photos showing a straight wall of Fort Pulaski. Six photos were taken from the same place. That’s what they look like. When you look to the left or the right the farther end of the wall looks smaller. That is normal, the way we see the world. Combining them into a panorama results in an image that has the same characteristics as the one of the street. Now it looks like the wall that it really is. This was done using Image Composite Editor with the Stitch – Camera motion control set to Planar Motion 3. The default setting is Rotating Motion – for the “normal” panoramas that are taken from one point. If you have not already discovered the links, each of the panoramas above can be seen larger by clicking on the images. The tool for that is “Zoom.it” – and that is another story. 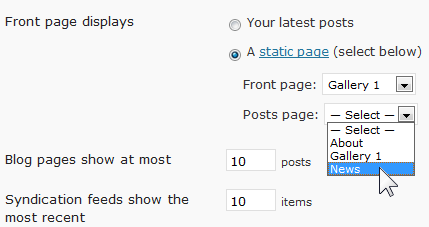 In another post, Setup and Maintain a Photo Gallery Page with Live Writer, I discussed setting up a static page on a WordPress blog as a photo showplace gallery. 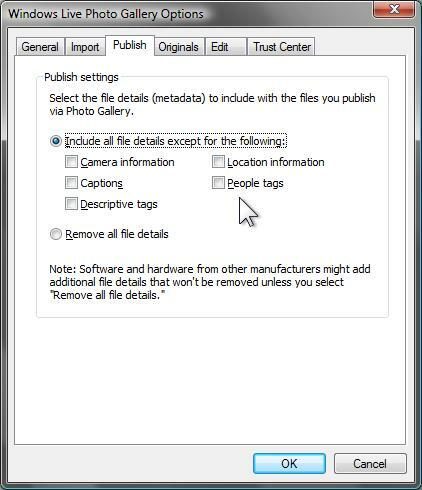 Here I want to present some of the methods for sourcing and displaying images using Windows Live Writer with a WordPress blog. For illustrations here I will use my blog named “Gallery Ludwig”. Using Windows Live Writer makes the “curating” job easy and straight-forward. Inserting pictures from your local computer offers the most options. Writer has some photo editing tools that present some interesting features. I wrote about the Writer photo edit tools in Photo Edit Tools in Live Writer. In another post I talked about Sourcing blog post images from SkyDrive. There are some additional features that I did not mention there. A reminder: Stick to sources on the web that are under your control and that you have the right to use! One of the nice features of Writer is that it lets you connect to a SkyDrive album and presents it with pretty art. This is only available for SkyDrive albums or newly set up albums with pictures from your computer. Now to the details of adding a SkyDrive album. Click Insert on the Ribbon. Click Photo album. Click Add online album. This is illustrated above. Just select one of the albums and click Insert. Writer downloads the images to prepare a nice display. A new tab on the Ribbon opens, “Photo Album Tools”. The default album layout is called “Squares”, it can show as many as 41 thumbnails. 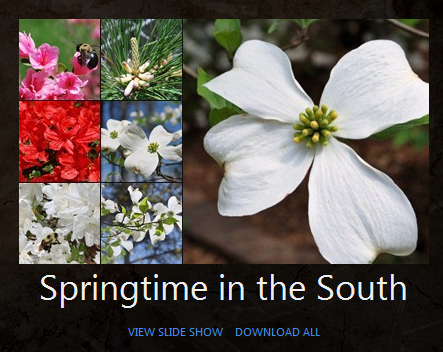 What is especially appealing, each thumbnail when clicked shows a full-browser presentation of that picture. Three other layouts show overlapping thumbnails. These are called “Spread”, “Fan”, and “Scatter”. All but the first-mentioned layout connect to a full-browser SkyDrive slide show when any part of the image (any thumbnail) is clicked. Unfortunately the slide show does not work in all browsers (as of January 2011) . The various layouts are all illustrated on my gallery page, Gallery 1. Showing an individual photo sourced from SkyDrive is a little more complicated. 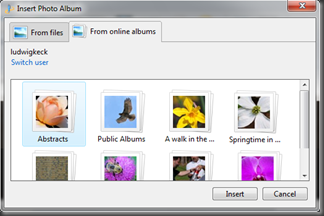 The command in the Insert tab Picture – From the web opens a dialog that requests the web address of the picture. 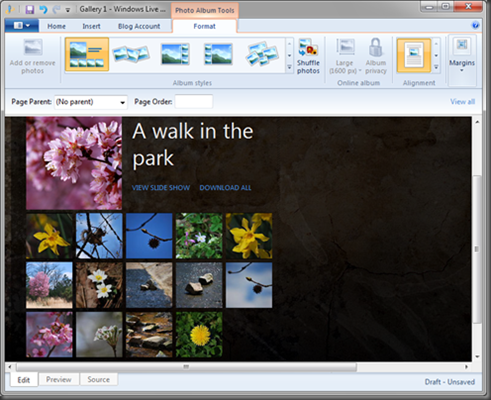 When you go to your Photos section on Windows Live and click to view a photo there is information about the picture (on the right, below an ad – here removed). The information includes “Web address” and “Embed” code. The web address is the address of the that page – that may not be what you want. The embed code works well enough (you can paste it in on the source view of Writer) and shows a thumbnail of the image. However, with that code the picture tools are not available. To get the actual address of the image on the SkyDrive server, click on the image so that it is displayed full-browser without any other material. The rather-long address then in the browser address bar provides the link to the full-size image. Get it by clicking in the address bar so all the text is highlighted, press Ctrl+C to copy it. That is the address to enter into the Insert Web Image dialog (Ctrl+V to paste it). Shortly (after download) the dialog window will show a thumbnail of the image and you will know that you got the correct one. Clicking Insert places it into the page. Now with Picture Tools (click the image to bring up the tab on the Ribbon) you can modify the size and placement of the picture. You will not be able to crop, rotate, or use any of the effects, the frame options will be very limited. You can assign a hyperlink to a picture to take the viewer to another page. Above I have linked the “Insert Web Dialog” image to the slide show of that small album. Here is how to do that: On the page showing the picture find the “Slide show” command (above the picture). Click Slide show. When the show starts, copy the address from the browser address bar. In Writer click on the image, click Hyperlink on the Home tab or the Insert tab or Link to: Web address… on the Picture Tools tab. Insert the address into the dialog. You can similarly install a hyperlink to the SkyDrive album page. Bringing pictures from your Flickr account is similar to the way it works with images from SkyDrive. You need the web address of the picture to enter into the Insert Web Image dialog. The primary page in Flickr is the “photostream” – that is where you get to with the “flickr.com/photos/yourname” address. Photos there are all shown in the “photostream” – photos can also be assigned to “sets” – equivalent to “albums”. When you click on a photo it opens up on its own page with a variety of information on the page. Right above the photo is a “Share this” link. Click this to get several options. One of them is “Grab the link”. This is the link to this page, not to the individual image. This is the address that Flickr wants you to link back to. So copy this address to use in the hyperlink for the image on your page. You still need the address to the actual image that you want to show. There is another option “Grab the HTML…” – as with the similar code from SkyDrive, this code does contain the address, but is this is not the way to insert an image in your posts or pages. An easier way is by way of the “Action” link. Here there is a “View all sizes” option. This leads to a page with size options. Clicking on a size option places a image of that size on that page. Click the size that you wish to use on you page. Then right-click on the image and click Copy image address. If there is no such option, select Properties and find the address there. Use that address in the “Insert Web Image” dialog. Note: If the thumbnail image does not show up there, you did not get a valid address. 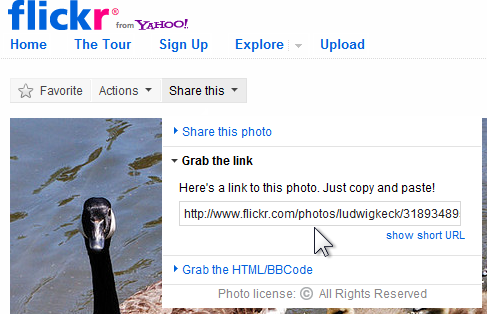 Be sure to select the inserted image and assign a hyperlink to it using the address from the “Share this” – “Grab the link” – to allow the viewer to get to your Flickr page (and to satisfy your obligation). This shows your Flickr photo full-browser in a black “lightbox” – very nice. You can link back to a slide show of a set (or the whole photostream). On your photostream page click on one of your sets. Click Slide show (near upper right). The show will start. Grab the address from the browser address bar. Use this address as the hyperlink for the slide show. Here I have assigned a slide show hyperlink to the illustration at the right. Flickr slide shows work in most browsers. Picasa Web Albums has a landing page with albums. That is the page you reach by your address of this form: “picasaweb.google.com/yourname”. Click on an album icon to go to that album page. Click on a thumbnail to go to the page for that photo. Right-click to get the web address of the image (you may have to select Properties first). The address so obtained is the address to use in the “Insert Web Image” dialog. If there is no thumbnail image in that dialog, you did not get a valid address. Note the image size you get with that address is the same as on the Picasa site. That should be fine for a gallery page. Of course, it will have your name, not mine in it, and the name of your album. I show this address here so you can try it. Compare what to get by clicking the address above and the image above. This should get you well underway in building your gallery page with images from your various photo sharing sites. Enjoy!